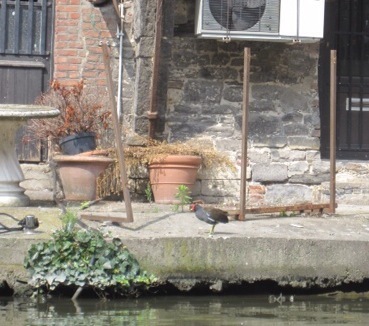 So, as well as having A LOT of spectacular buildings, Ghent also has cool birds along the river (River Lys) and canals. 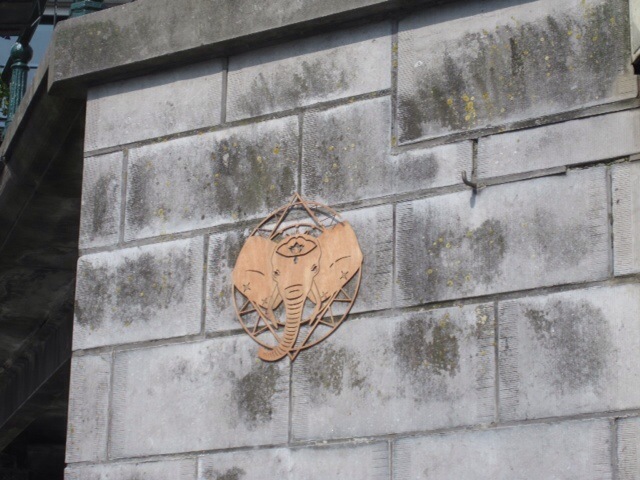 So most of my blog about our rest day in Ghent is about buildings and birds. After breakfast (unremarkable and uninspired) we walked down to get a load of laundry done. Expensive, but we appreciated the woman who let us know that the dryer we were using was known not to work well, as well as her graciousness when I apologized for only speaking English. 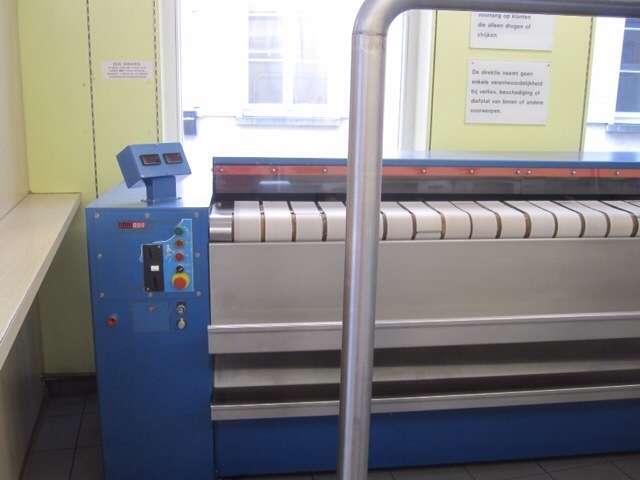 And Angie loved this massive ironing machine. 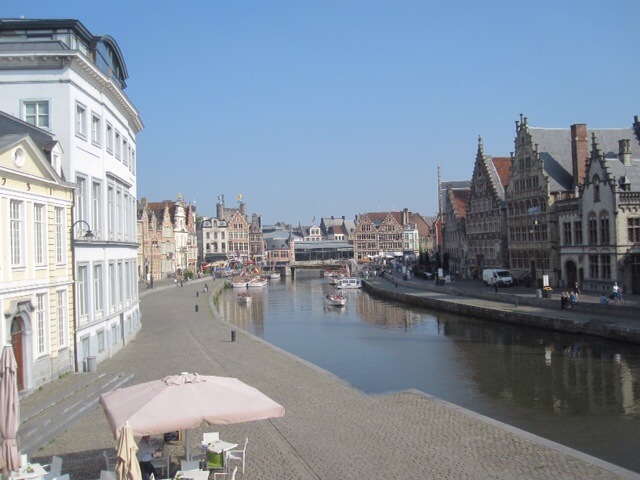 With our chores taken care of for the day, we walked to the bridge by St. Michael’s Church, where it is said one will have the best views in all of Ghent. We agree. 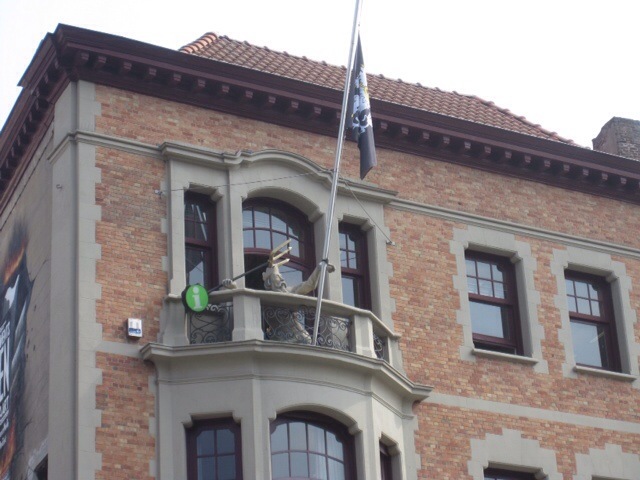 We enjoyed the surroundings for some time and then made our way to the Voorhuis, further to the south of the city. 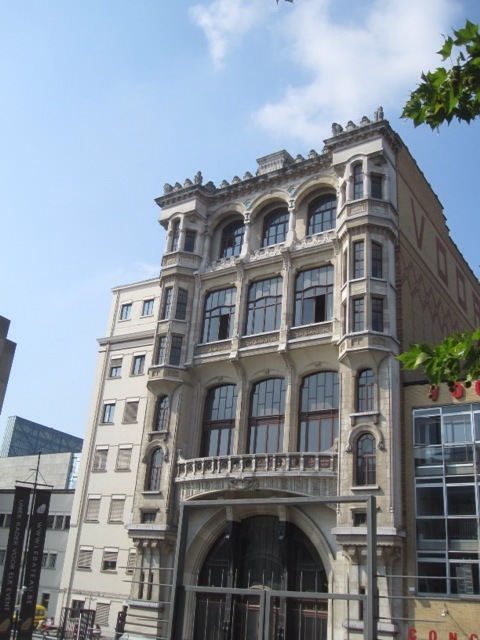 This is described as a beautiful building that was established for the people, but only one side of it was interesting from the architectural standpoint of us traveling neophytes. 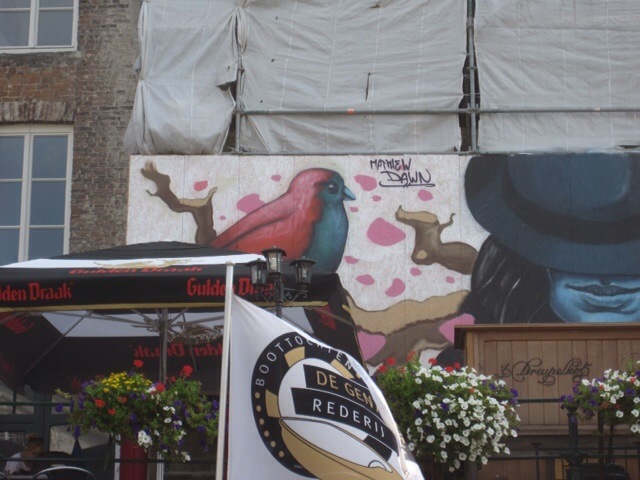 However, the space has been revived for various uses, including a cafe with an amazing terrace. It only opened a year or so ago but apparently has already become a go-to destination (oh, and free wifi that actually works). We got there a little before noon, got some pretty good food, and thought, yeah, this is ok. Then suddenly, the terrace bar opened and the place completely filled up, mainly with young people enjoying a lovely day. From there we took a quick trip back to the hostel because we’d forgotten to go to the loo at the Voorhuis and the ones at the tourist information center didn’t actually exist, despite the signs we saw saying they were there. 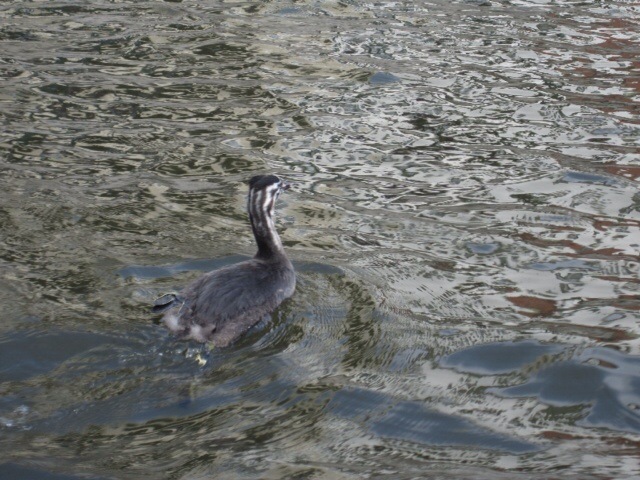 On the way to the hostel, we saw our first cool bird of the day, some sort of water bird we couldn’t identify. All that taken care of, we headed over to one of the many quays (kaai) to be super touristy and take a guided boat trip. I’m glad we did, because we got some great views of the city that we would not have seen otherwise, learned a fair amount about the city, and saw some great birds! We went down some of the canals we hadn’t noticed so far, and also experienced the lovely quiet of the area where we’ve been staying. Our guide cut the engine on the boat and we could hear, nothing. Lovely. 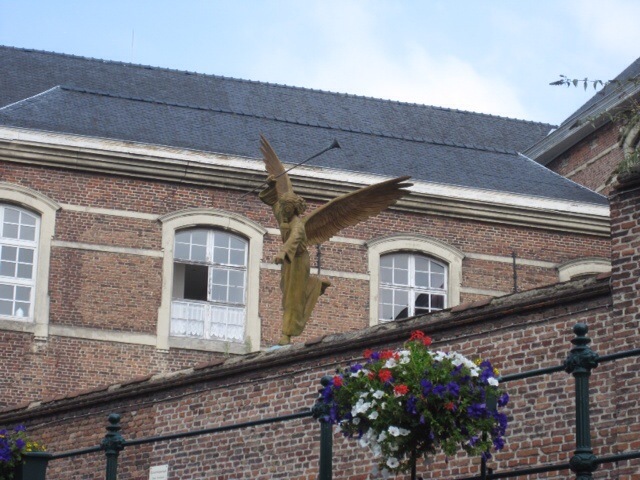 He showed us some cool art, including works related to one of the lecherous Belgian kings, and one that Angie and I had noticed while walking, an angel wearing a gas mask on the wall of one of the monasteries in town. 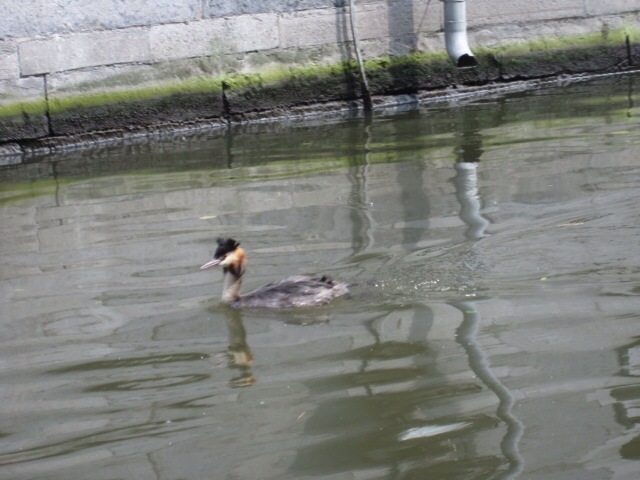 As I said, we also saw some cool cool birds, including a moorhen and a Great Crested Grebe and a juvenile grebe. And yes, turtles! I know they’re not birds, and they are not indigenous. 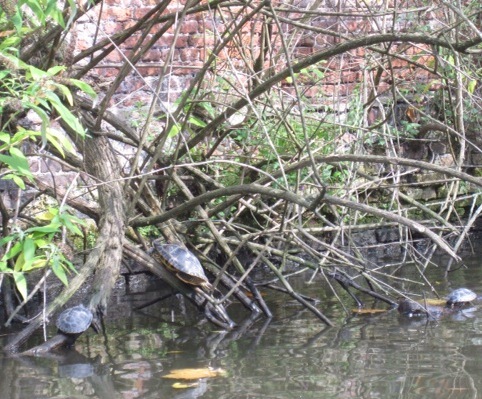 Most likely a couple escaped or were released and they and their offspring hang out near the end of one of the canals. 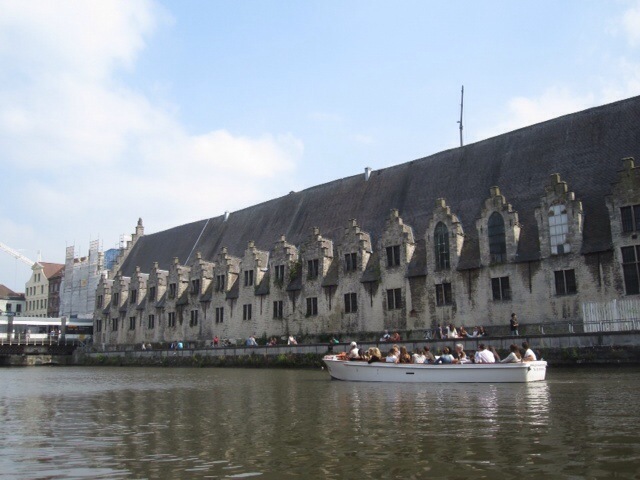 Among the great buildings pointed out by our guide were a no-longer-used abbey, and the meat and fish market. The fish market pictures are in the previous blog and the seaweed details are way cool. The meat market is now converted to shops highlighting the specialties of the region. The day was not over at the end of the tour. We took a longish walk south to one of the university neighborhoods because we’d found out about a truly reasonably priced Asian restaurant named Orientali. It was worth the walk for us, because it was really good Thai street food served with a smile (something you don’t see much of here based on our experiences). When we ask people here about reasonably priced food, they send us somewhere that has entrees in the €15-20 range, which is hard to do if we want to have any money left for the rest of our travels. We ate at Orientali for less than €20 total. We walked back toward the center of things quite slowly and settled ourselves in one of the outdoor cafés (there are tons, probably a good percentage of the 400+ restaurants in the city) for a nightcap. 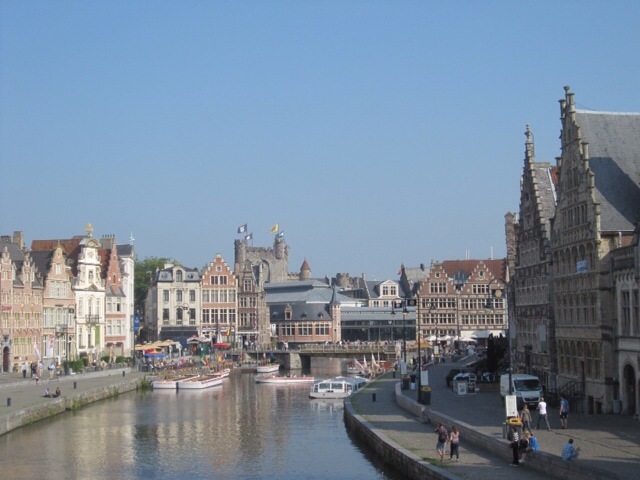 We took our time enjoying our drinks, because we had also heard that one really should see Ghent by night too. Of course we were impatient, but as it slowly got dark, the lights came on at many of the buildings around us, and we strolled back to the hostel via the St. Michael’s Church area, where we experienced some pretty spectacular views of the city. No pictures because it would have been hard to capture what we saw, but the views were even better than what we saw during the day. 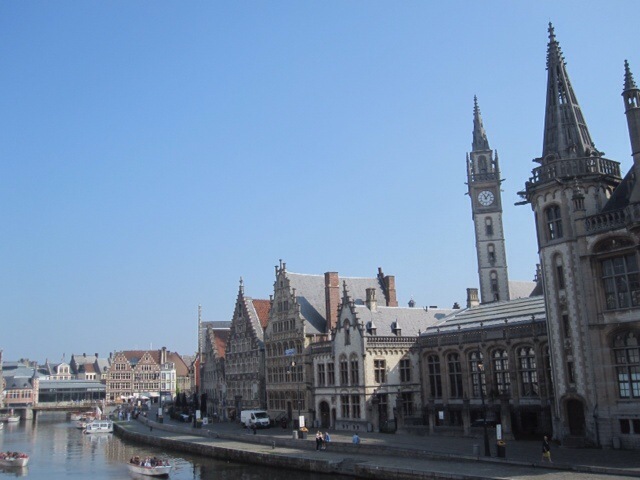 If you come to Ghent, do that, and walk around so you get to capture the beauty from many angles.